The first of three Free Summer Lectures on Inequality. Given by Danny Dorling in London on Tuesday May 22nd 2018 at 6:30pm in Bethnal Green. A video of the recording of the lecture, with slides embedded, can be played below. The second free lecture will be given by Sadiah Qureshi on June 21st 2018 entitled: ‘There is Black in the Union Jack’: Britain’s forgotten history, tickets available here. The third free lecture will be given by Rosemary Ashton on July 19th 2018: on: ‘Affordable Education for All: The Pioneering Contribution of Victorian Bloomsbury’, tickets to be found here. 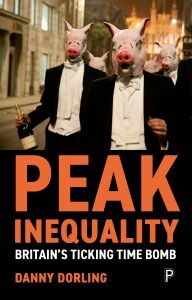 ‘Inequality the big picture’ was based on the forthcoming book ‘Peak Inequality: Britain’s Ticking Time Bomb” – to be published on July 17th 2018. Thanks are due to Drew McFadyen for recording the lecture, and Jonny Mundey, Barbara Gunnell and Peter Wilby for arranging it. Finally change happens and their memories change with it. They will say that they believed in the change as desirable all along; they somehow saw it coming and so, too, were on the right side of history. Then we can all forget that just a few years ago they had so vehemently opposed the change, had justified the status quo, were so very scornful, and ultimately wrong. What matters is ensuring that we are now at the peak and starting on our way down.